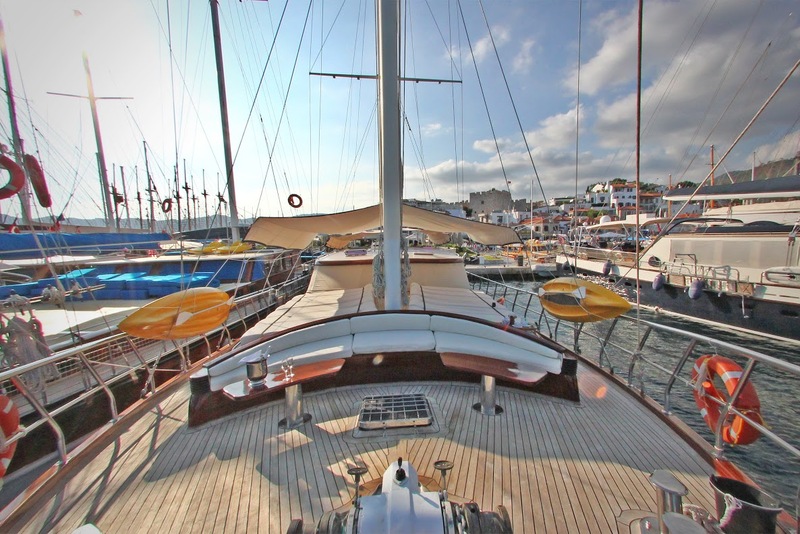 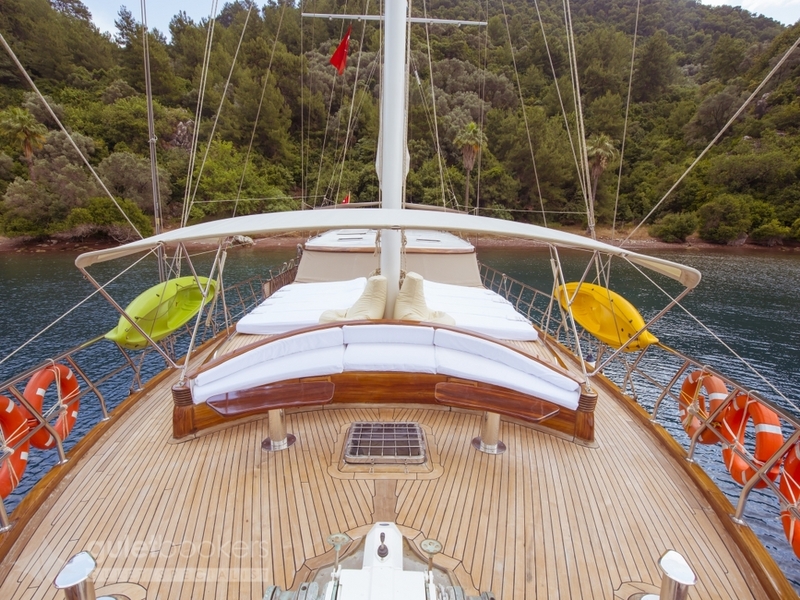 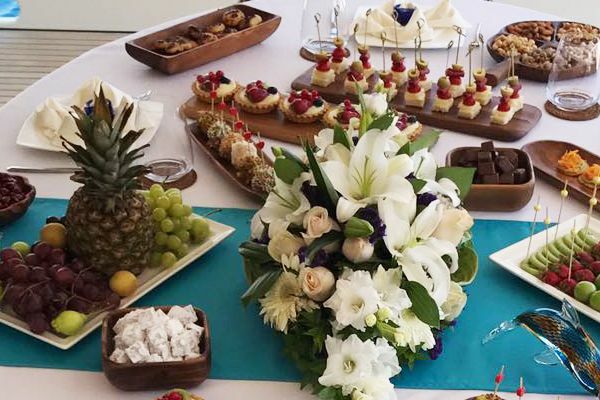 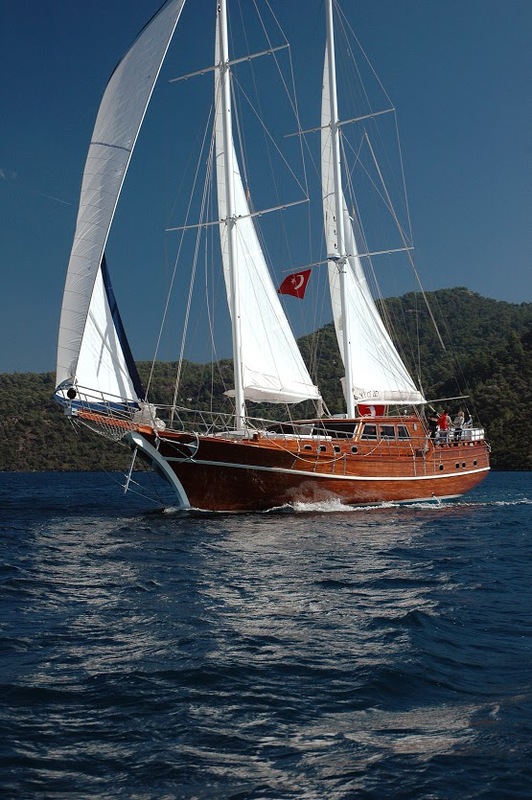 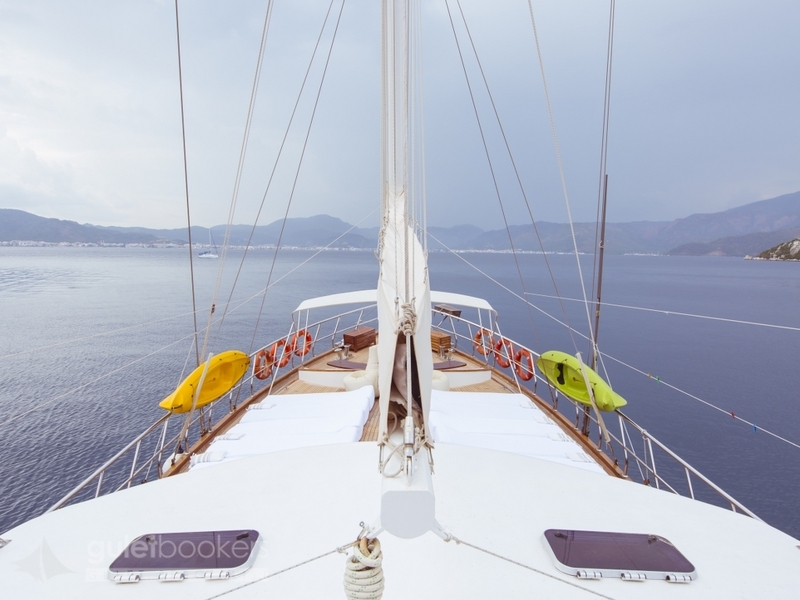 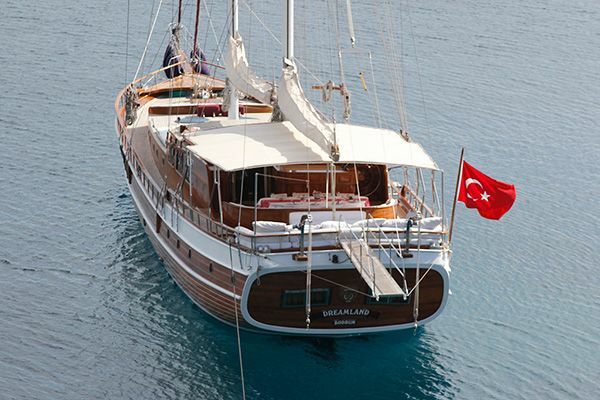 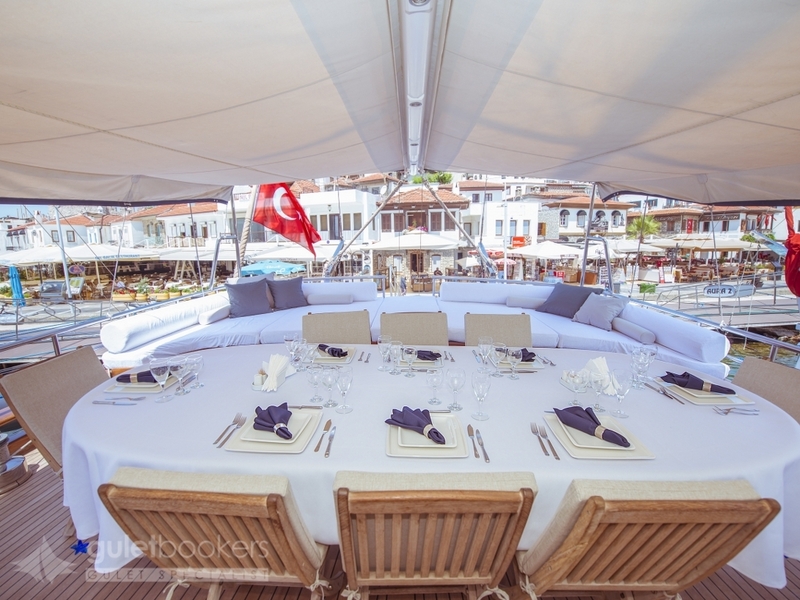 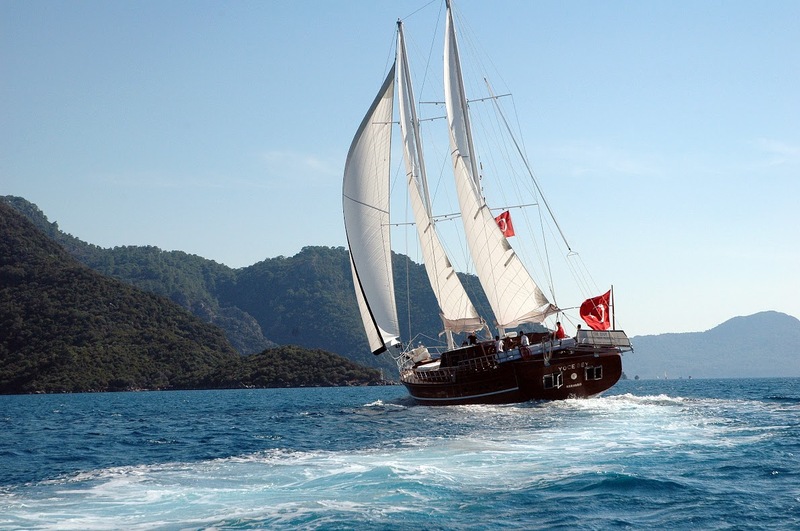 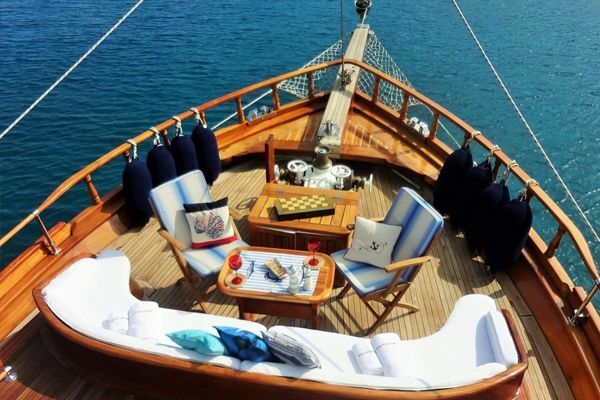 The Luxury gulet Yucebey gives the classic sailing gulet experience in its 24 meters of luxurious space and design. 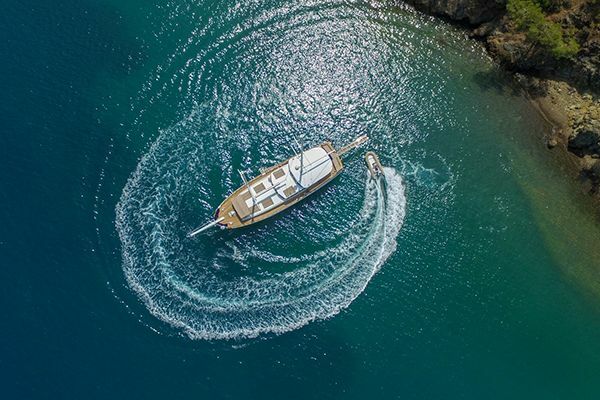 In fact it gives the impression of a larger yacht with its light, contemporary layout and fittings in the spacious air-conditioned five cabins for up to ten guests. 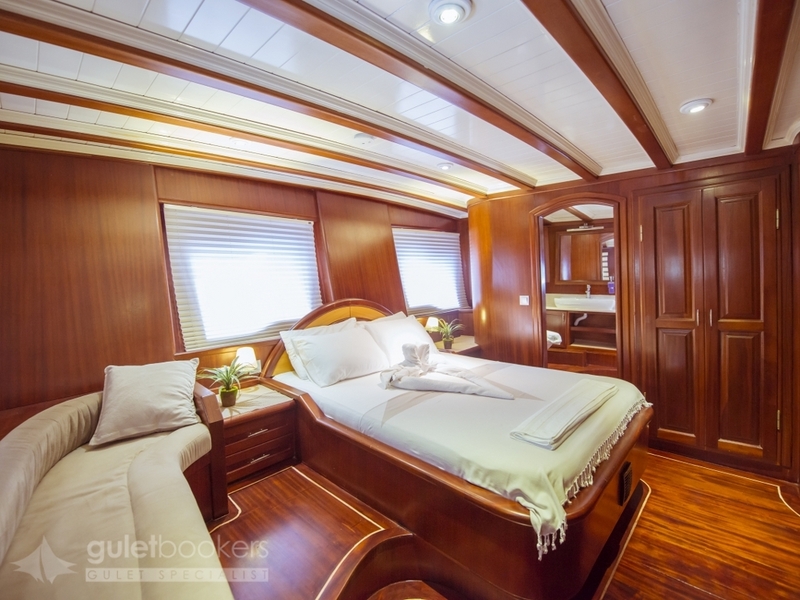 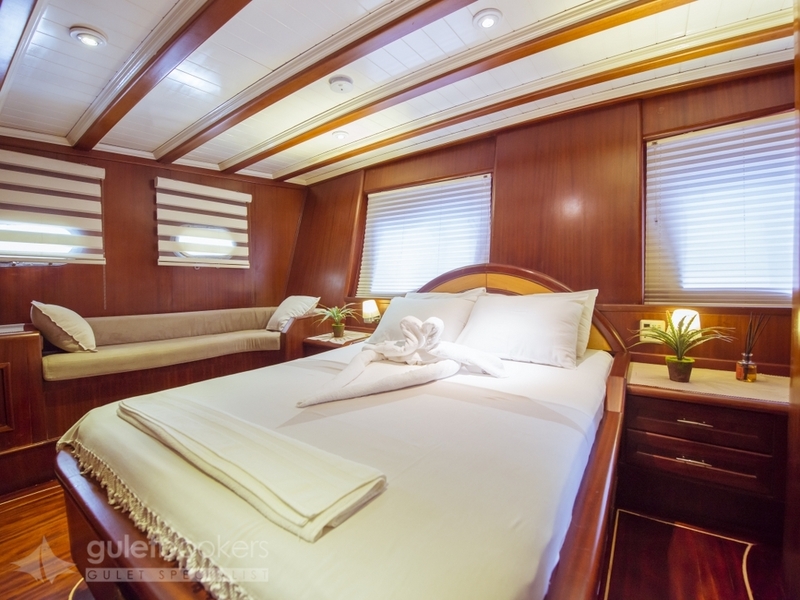 The master cabin enjoys the full beam width aft with a walk-around queen size bed, and side seat, and ample storage, while the two twin cabins are placed each side of it. 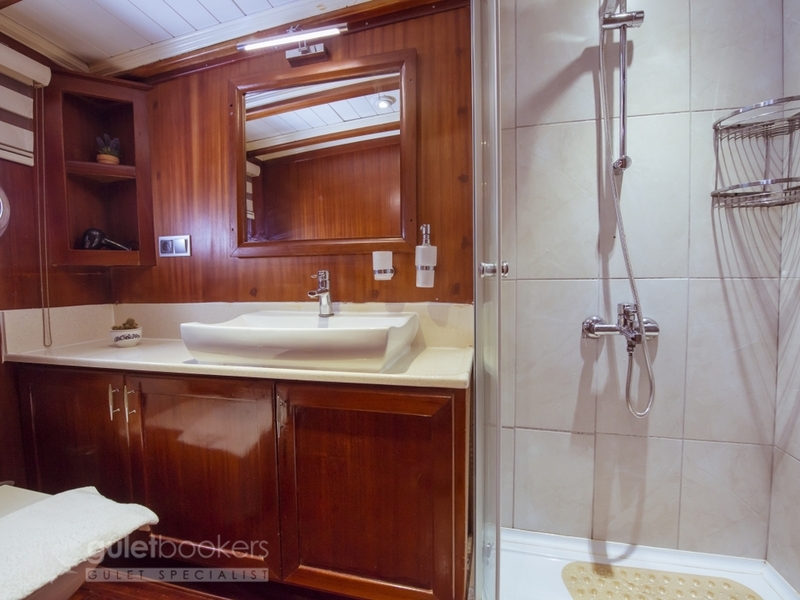 The two double bed cabins are placed forward of the indoor saloon access so a degree of privacy is possible for families or small groups. 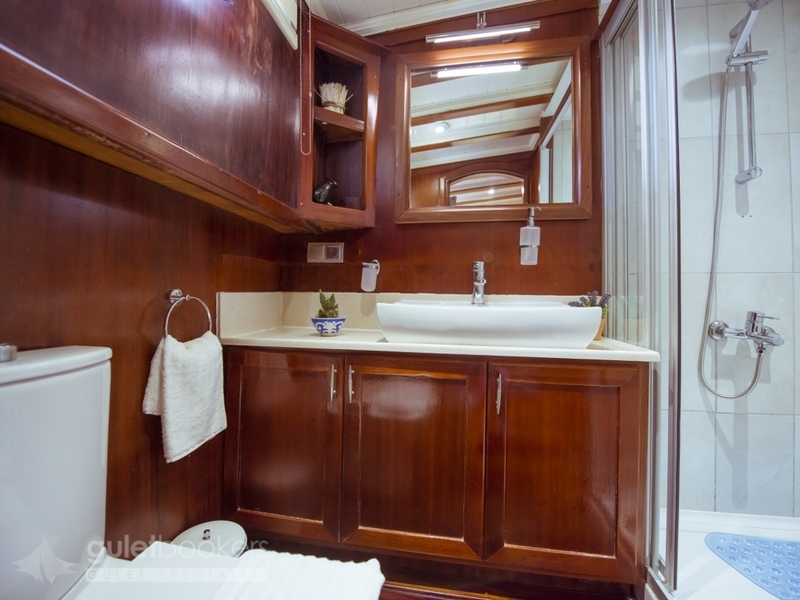 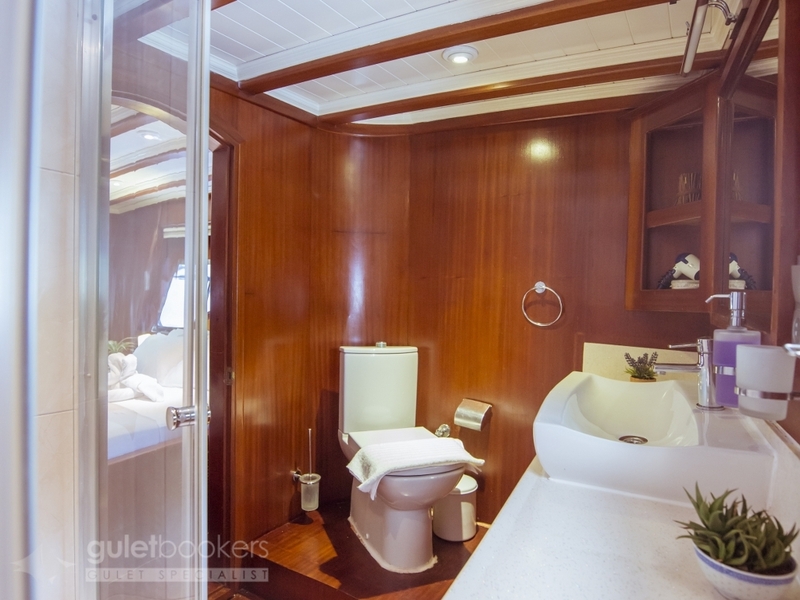 All cabins have well fitted private bathrooms. 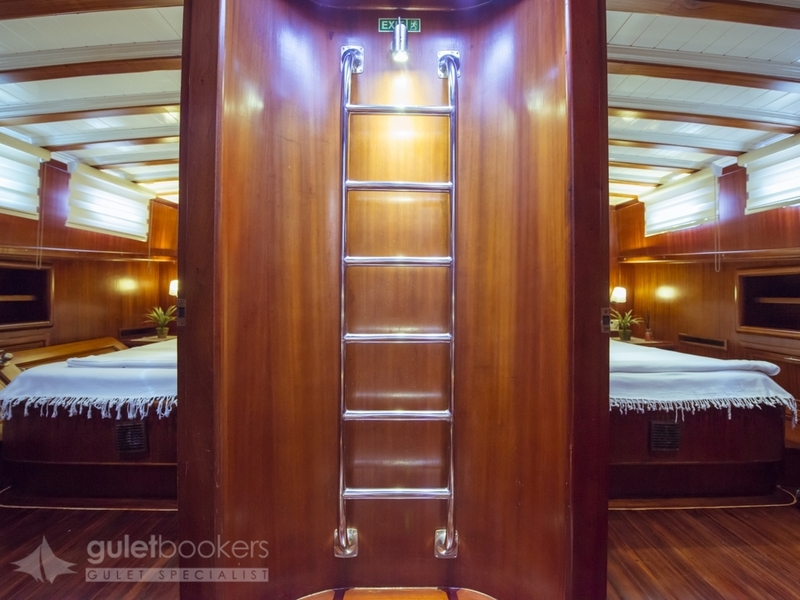 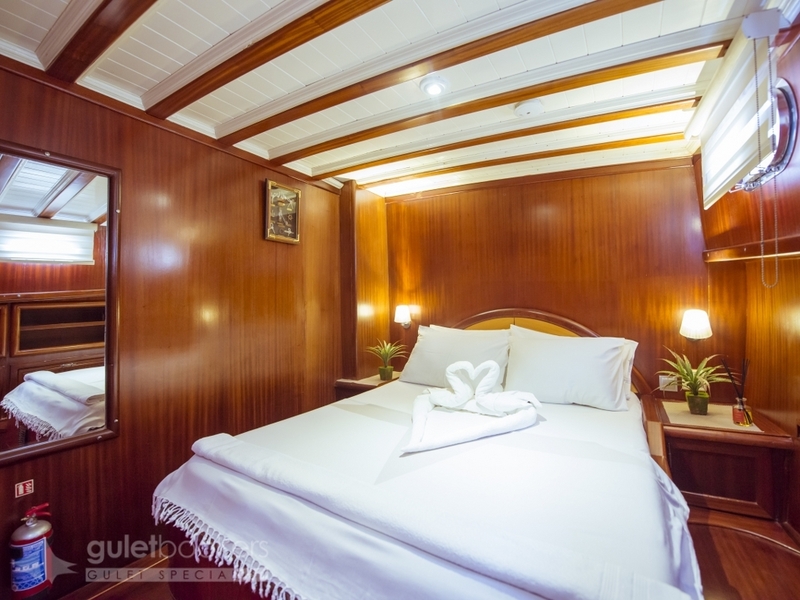 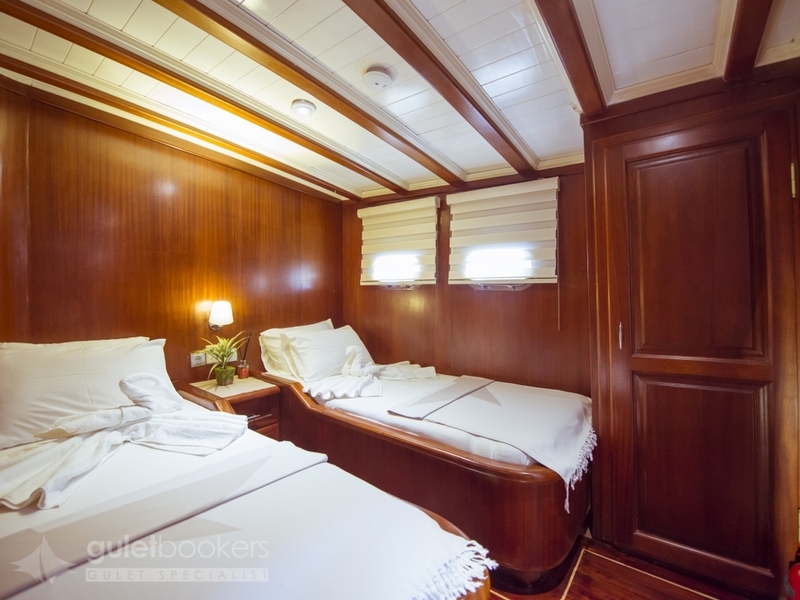 For shared space to relax in there is the air-conditioned indoor saloon with a comfortable cushioned seating bench at the indoor dining table set across from the well-equipped galley where all the best meals are created. 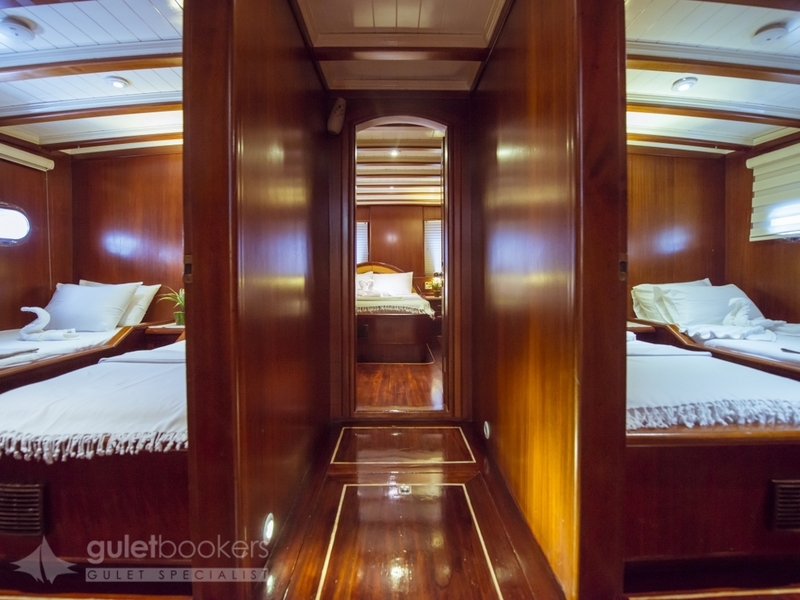 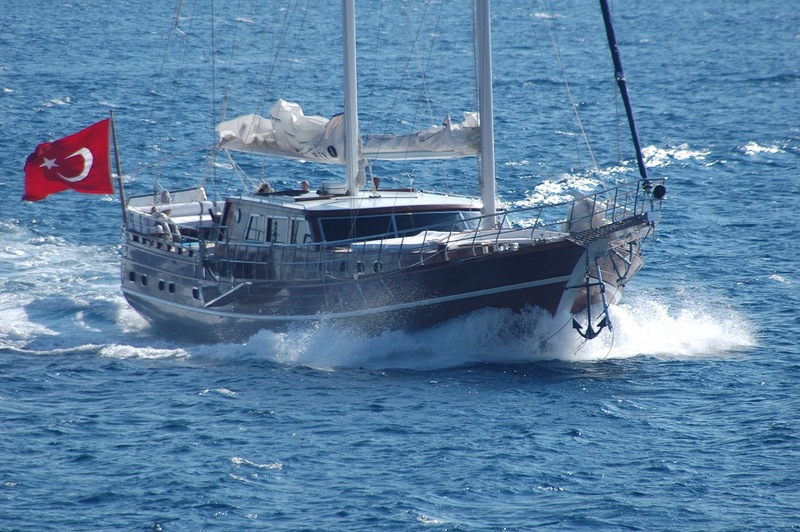 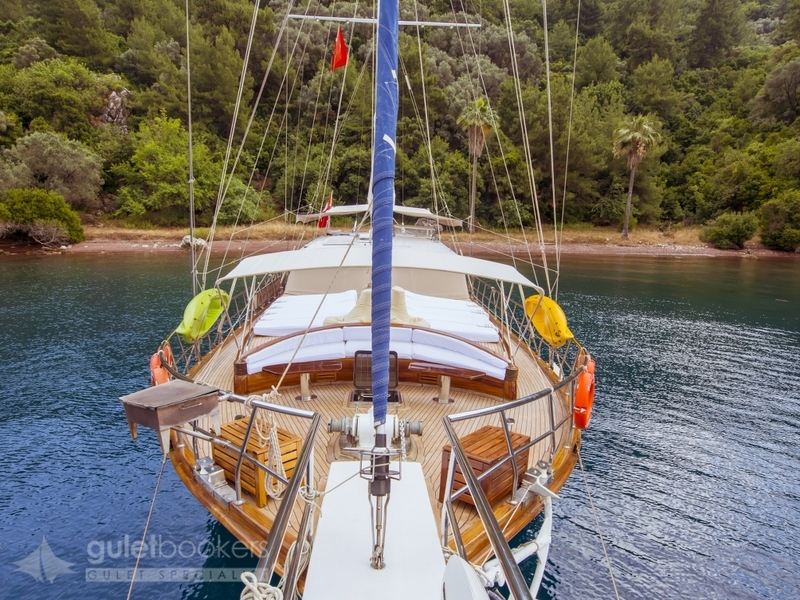 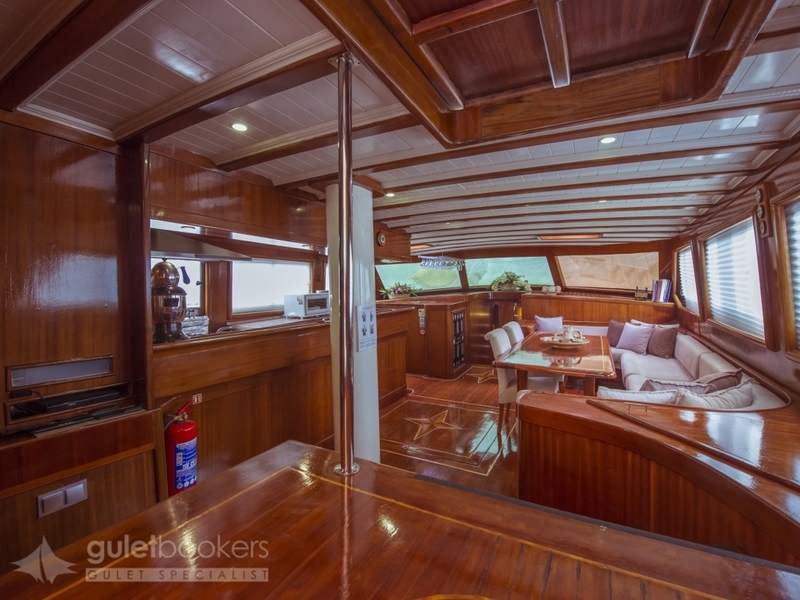 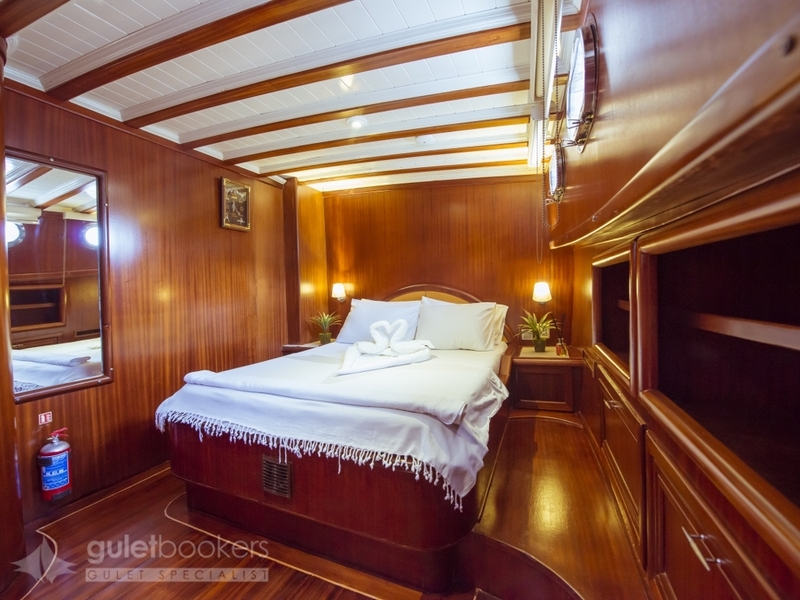 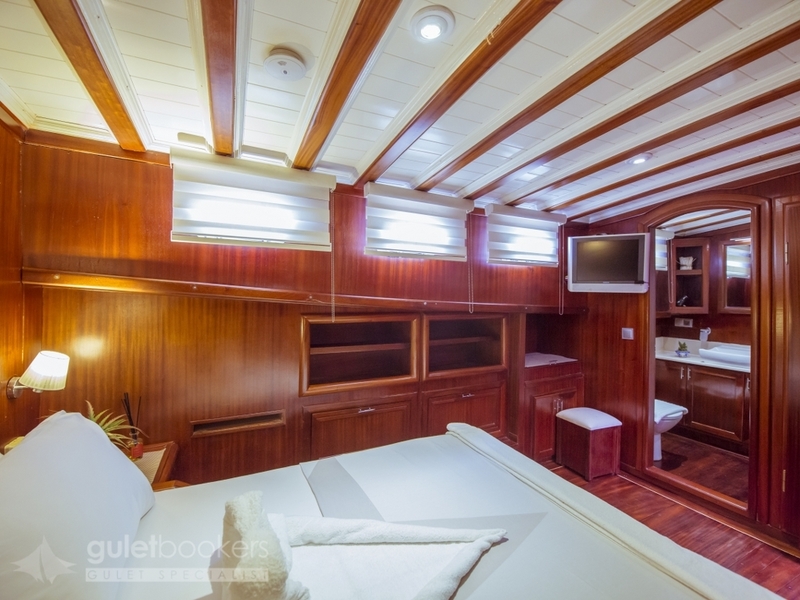 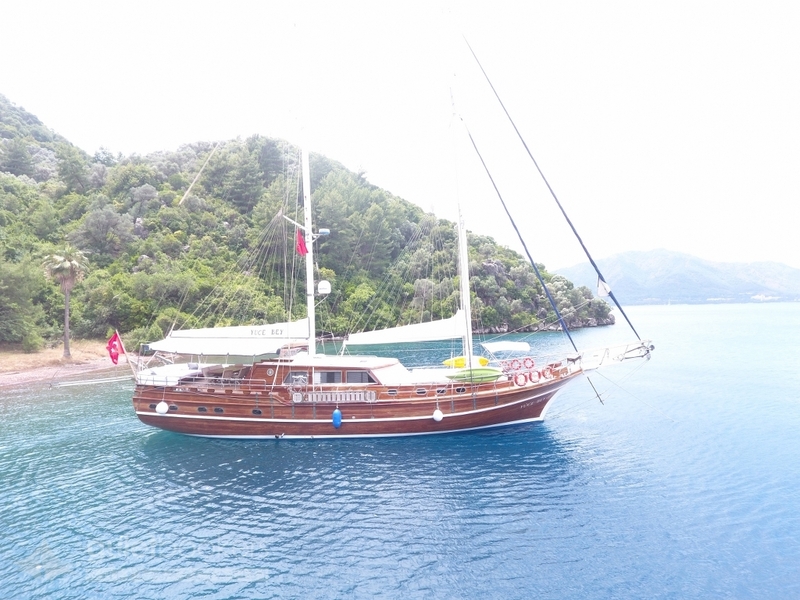 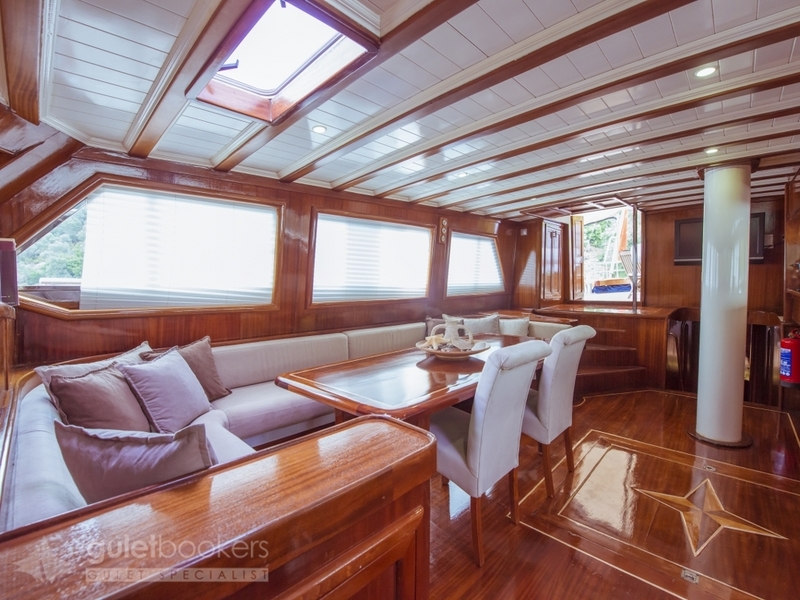 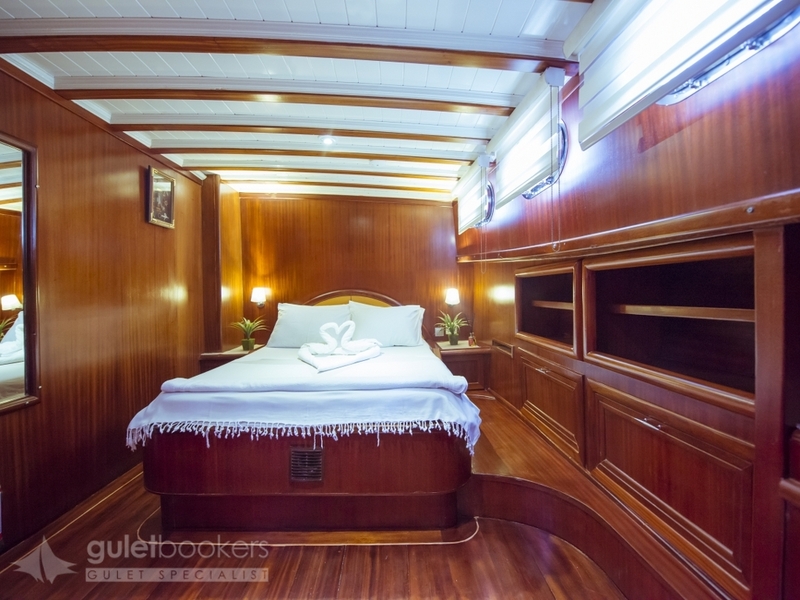 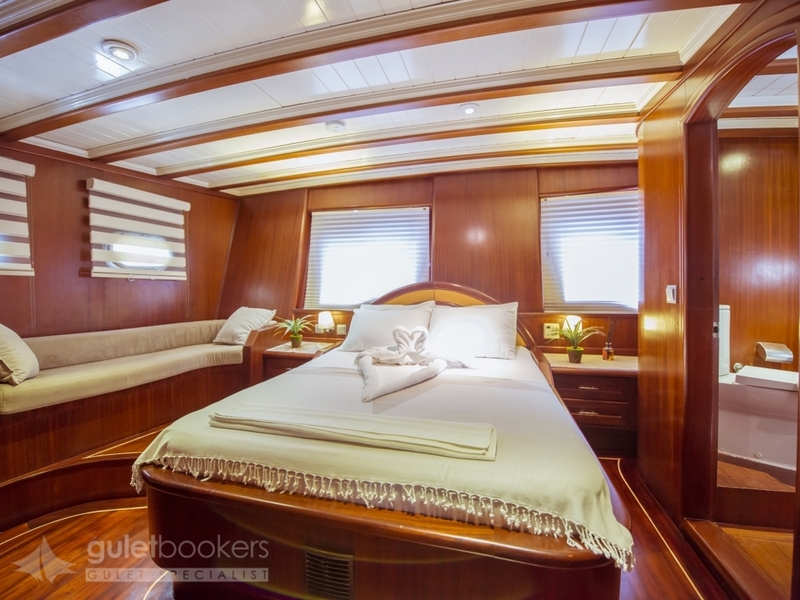 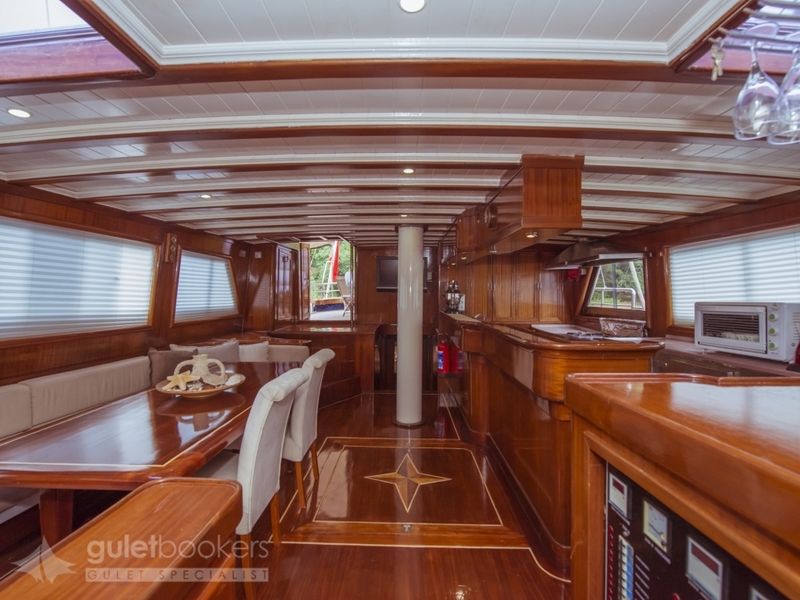 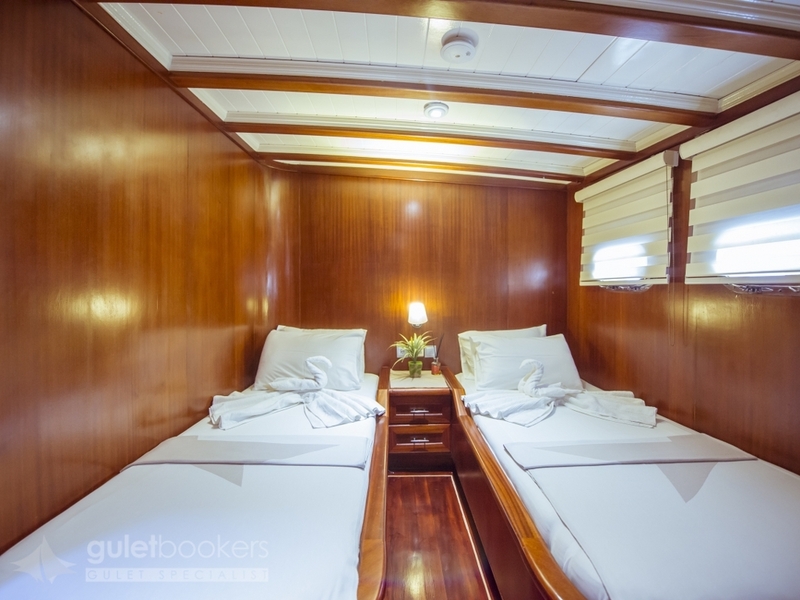 The TV/DVD and music system, internet access and the bar complete the indoor comforts of the gulet. 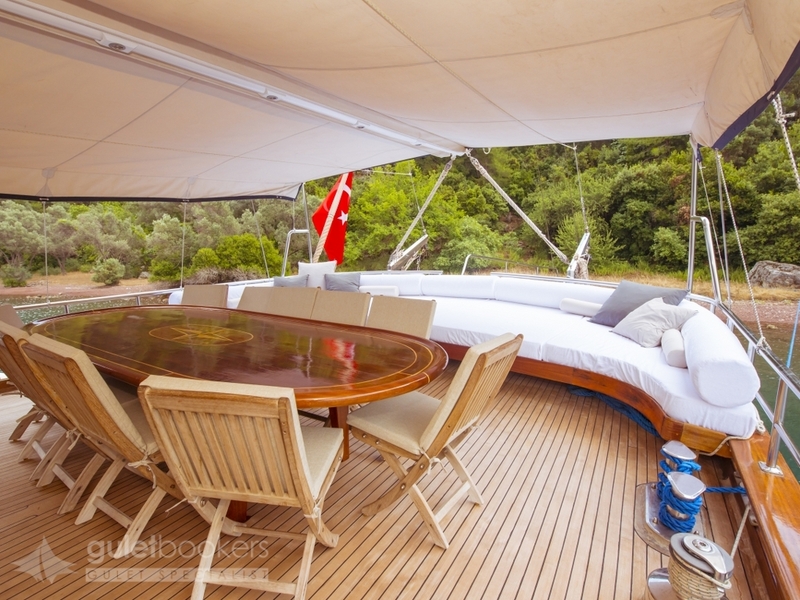 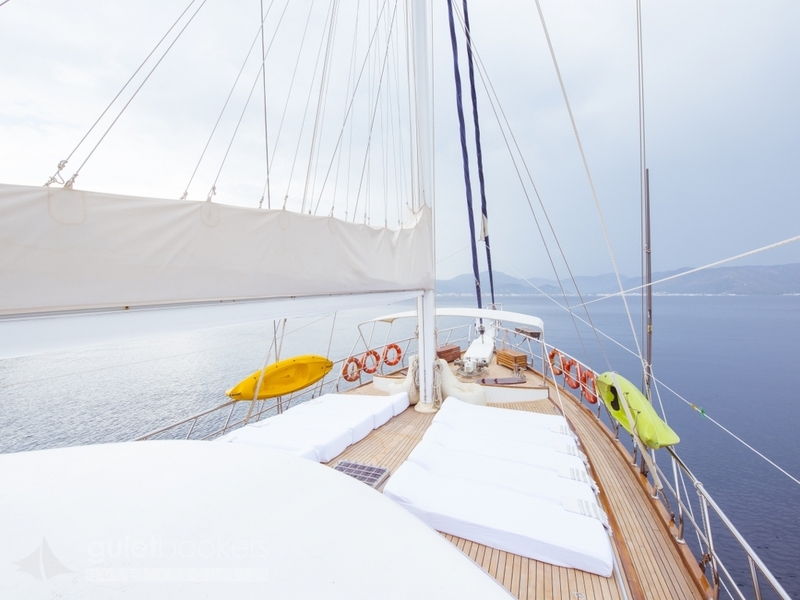 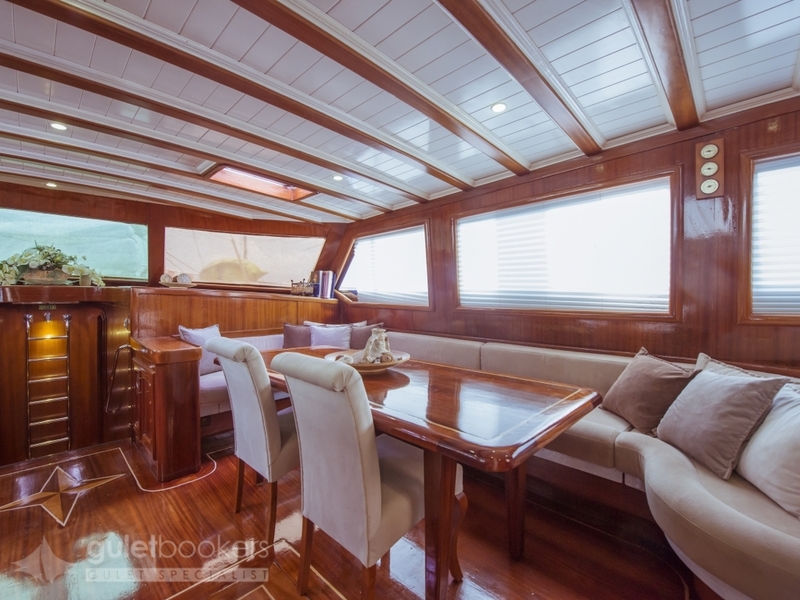 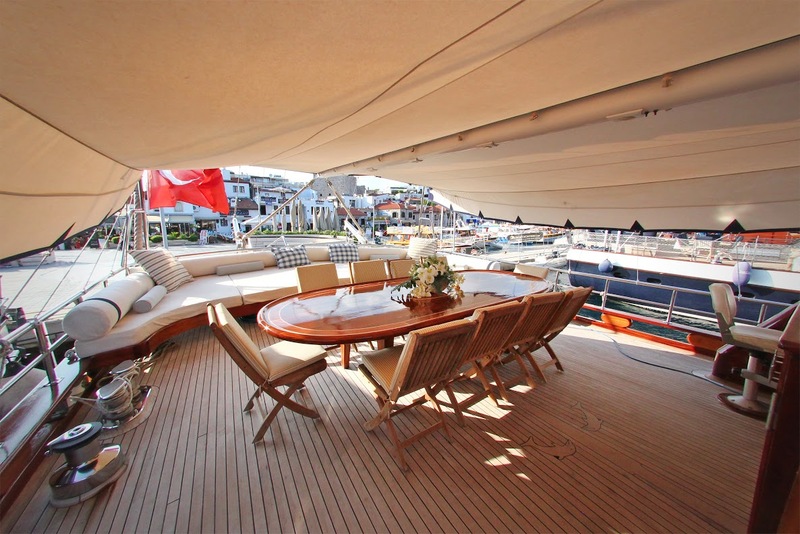 The particular design of the wooden gulet allows a large table with chairs for al fresco dining on the aft deck under the awning, and there is even more space to relax on the wide cushion pad that occupies the whole width of the stern, or on the foredeck sunbeds and bow seat. 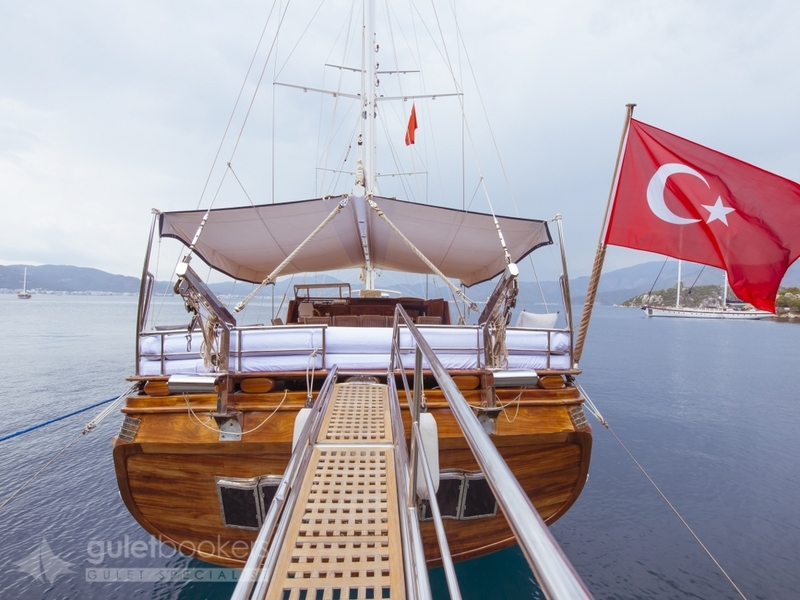 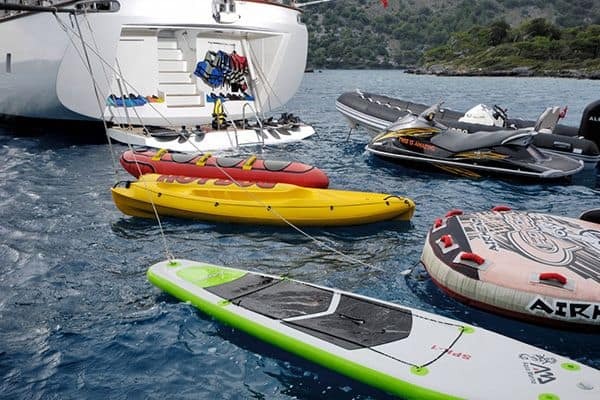 A cruise is not all about relaxing though as there are plenty of bays to play on the gulet Yucebey’s generous set of water toys and well powered tender, or exploring historical sites or in local town harbours along the Aegean coasts. 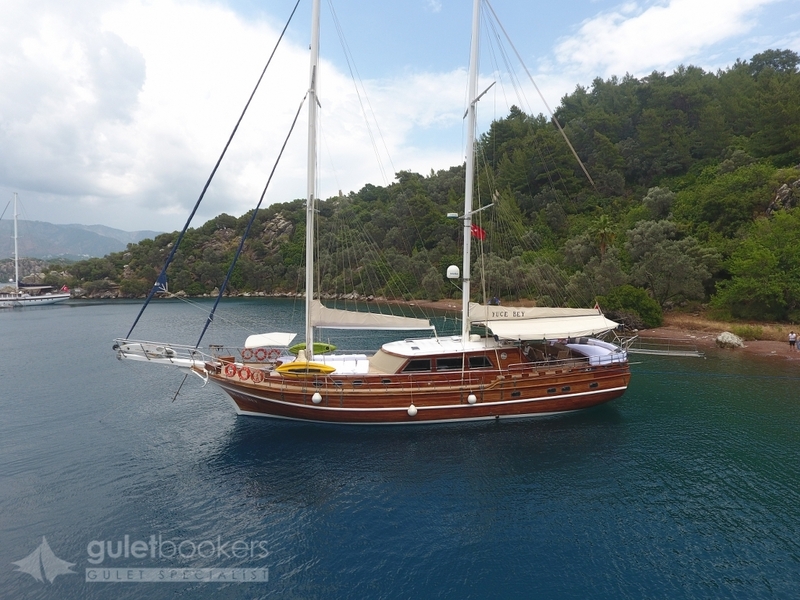 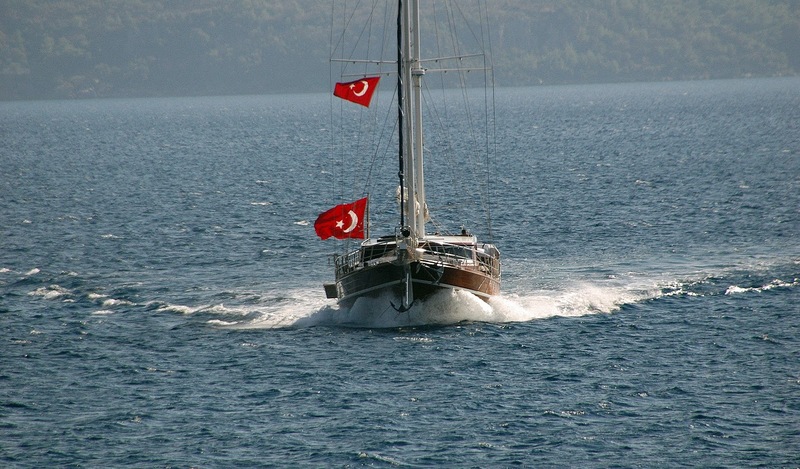 The professional team of captain and crew of three can take the Yucebey gulet guests for a memorable holiday cruise along the Turkish coast or nearby Greek Islands finding anchorages in quiet coves, shaking out the sails in the afternoon breezes, and creating a great mix of activities for the holiday afloat.